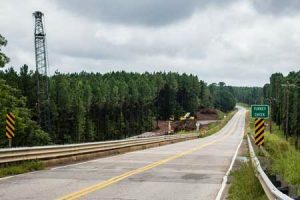 The SC Department of Transportation confirmed Friday, Aug. 16, that construction on Turkey Creek Bridge on Hwy 25 is slated to begin Monday although crews have been active clearing trees and debris from the area for the past few weeks. SCDOT Engineer, Tom Dorn, told The Advertiser that while the actual construction to the bridge will begin next week, it will probably be several months before the public is able to see progress on the project as much of the early stages is done on the bridge’s substructure. According to Mr. Dorn, the DOT plans to keep the bridge open to the public until the new bridge is completed although there will be minimal, sporadic lane closures during the project’s progress. The completion date for the new bridge is scheduled for Nov. 2014.